Measure flour into a mixing bowl and make a well in the center. Into the well add the eggs, water, milk and melted butter. Beat until well blende. Cover and chill for one to two hours. With butter or margarine lightly greaase a nonstick pan and heat over medium heat until hot. Pour ¼ cup of the batter then tilt immediately the pan in all directions to spread bater quickly and evenly over the surface of the pan. Return to heat and cook about 1 minute or until almost dry on top and lightly brown on the edges. Grasp edges with your fingers and flip over other side into pan. Or use a wide spatula to flip the crepes. Cook the other side for half a minute or until lightly brown. Slide crepe onto a palte or waxed paper. Repeat procedure with remaining batter and stack the crepes with waxed paper in between them as they are cooked. Fold the crepes into quarters. Set aside. Melt the butter in a skillet over low fire. Add the sugar and allow to melt. Remove skillet from the fire. Arrange three folded crepes on the skillet over the sauce. Return skillet to the fire. Allow crepes to simmer in the sauce for about 10 minutes. 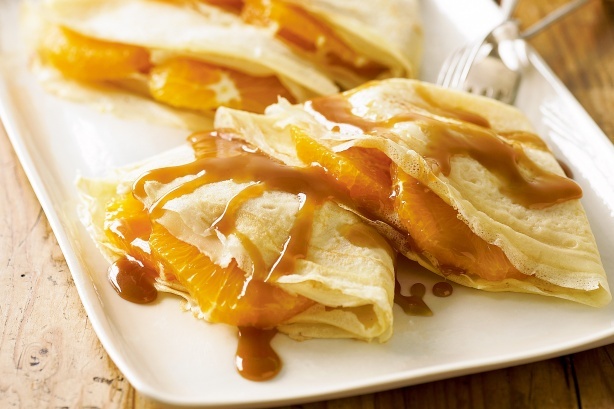 Pour fresh orange juice and add the orange rind while crepes are simmering. Pour brandy over the crepes. Becareful as the addiotion of the alcohol will cause the sauce to flare up. The flame will die down on its own. Remove skillet from heat and serve crepes immediately. End.